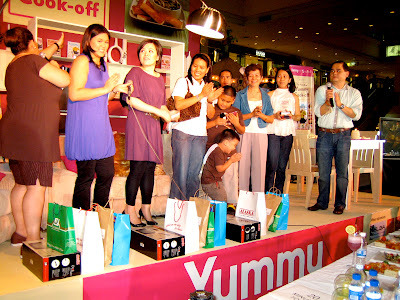 This is the first ever Yummy Magazine's YUMMY COOK-OFF held last September 30, 2007 at Shangri-La Plaza Mall Activity area. The event was graced by guests and spectators from the mall. 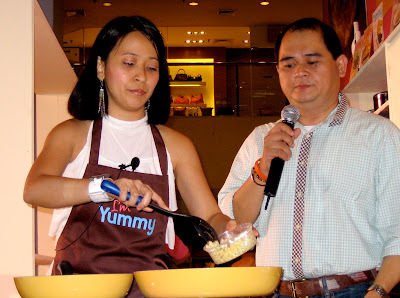 The event was hosted by Ruby Rodriguez and Chef Jun Jun De Guzman. 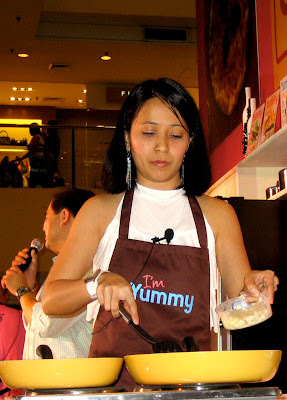 The Yummy Cook-Off was divided into 3 Categories. Mom vs. Mom, Blogger vs. Blogger and Chef vs. Chef. 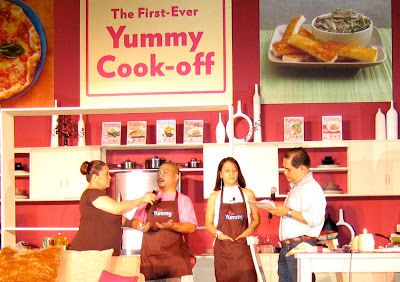 The one-on-one competition per category took place on stage with kitchen facilities. 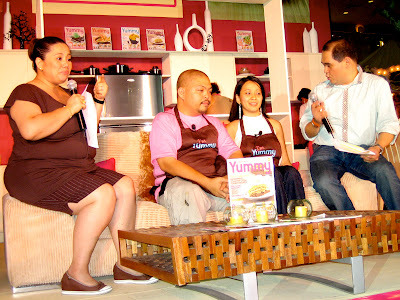 The contestants cooked their yummiest dishes in front of a huge crowd. A lot of pressure! I was invited to compete by Melanie Montemayor of SUMMIT Media. I gladly joined the Blogger vs. Blogger category. Jun of Dalanghita.com was my opponent. I helped my opponent to pre-cut his ingredients before going on stage so that it wouldn't consume his time. Mine was pre-cut already so I think it would have been unfair if his ingredients were not pre-cut because we only had 30 minutes to cook everything onstage. I cooked my specialties like Chicken Kebabs with Capsicum and Garlic Yoghurt Sauce, Wine Scampi Linguine, Lettuce-Grape-Calamari Salad and my version of Piña Colada. I won the blogger category and took home the trophy, tons of gift packs, gift certificates and cash. More than those things, I am glad to receive recognition from the judges. Thank you to Melanie Montemayor, Maan Pe and Sharlene Tan and all the Yummy staff. uy joan, di ko alam to ha... CONGRATS!!! sana you told us para may pala ka. haha. Hi Joan! 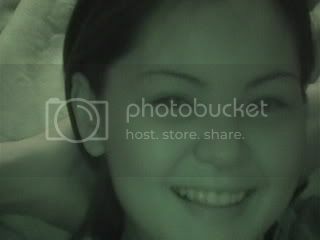 I'm Pilar...Jay S.L. 's sister. 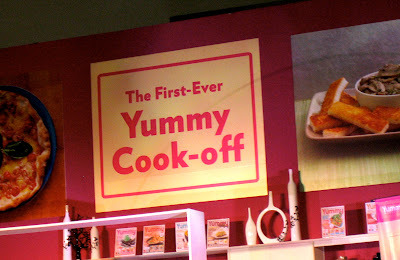 I was there at the cook-off! I was like a seat behind the judges table, front and center. Anyway, that event was packed with people and free food. Yummy gave away tons of prizes during the raffle...I won a few myself. Thanks a lot! Hope you'll dine soon. Kahiya naman. Ok lang my dad and sis was there naman. Thanks! sana you approached me. True, yummy gave me also tons or prizes for winning the blogger category. Hope you'll dine also Pilar like your bro Jay.